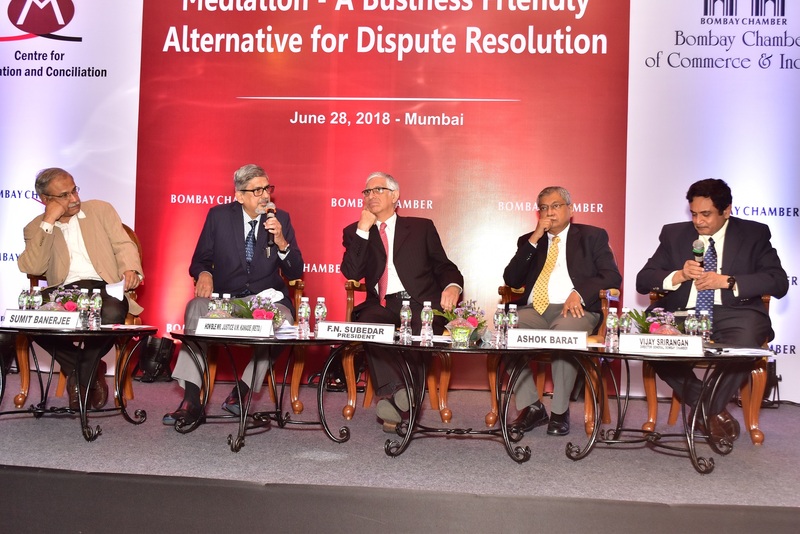 The Bombay Chamber of Commerce and Industry convened a seminar, ‘Mediation – A Business Friendly Alternative for Dispute Resolution’ at Mumbai on 28 June 2018, to mark the launch of its Centre for Mediation and Conciliation (CMC), with its website being inaugurated by Hon’ble Justice Mr. B.N Srikrishna (Retd.) at the Bombay Chamber’s 182nd AGM that ensued. The CMC has been set up under the Bombay High Court’s guidance to provide commercial dispute mediation services nationwide. Its Chief Mentor, Mr. Sumit Banerjee, is an IIT alumnus, formerly Vice Chairman at Reliance Cement, CEO – Infra Businesses at Reliance Infrastructure Ltd, Ex MD & CEO of ACC Ltd. and trained mediator. CMC’s panel mediators include Hon’ble Justice Mr. B.N Srikrishna (Retd. ), Hon’ble Justice Mr. V.M. Kanade (Retd. ), Mr. Bill Marsh from United Kingdom, Mr. Jeremy Lack from Switzerland, Mr. Prathamesh Popat from Mumbai, Mr. Sriram Panchu and Mr. A Jawad from Chennai and Ms. Ekta Bahl from Samvad Partners Hyderabad. In circumstances where organisations like World Bank have identified pendency of lawsuits and appeal tendency as roadblocks to doing business in India, CMC’s vision is to help create a harmonious business environment with enduring business relationships by encouraging dispute resolution through aided dialogue and concluding them swiftly, economically, confidentially and amicably. The seminar was graced by Hon’ble Justice Mr. V.M. Kanade (Retd. ), who, in his keynote address, highlighted that businesses preferred writing off disputes as bad debts to litigation and stressed the necessity for mediation awareness. He also lauded Bombay Chamber for being the “only institution” to be recognised by the Bombay High Court. CMC’s Chief Mentor, Mr. Sumit Banerjee followed, with a succinct presentation highlighting the advantages of commercial disputes mediation, its value to India Inc, successes in other jurisdictions and the mediation services offered by CMC. The seminar featured a panel discussion on “How can Mediation succeed in India” with moderator Mr. Tarun Nangia (Associate Director, NewsX TV) and panellists Ms. Sucheta Dalal (Trustee, Moneylife Foundation), Mr. Saugata Chakravarty (General Counsel, Siemens Ltd), Mr. Mukesh Chand (General Manager Legal, SIDBI), Mr. Suresh Kumar Sharma (General Counsel, Partner, Deloitte Shared Services India LLP), Mr. Chakrapani Mishra (Partner, Khaitan & Co) and Mr. Rajiv Mohapatra (General Counsel, Home Credit Advisory Services India). Each panellist shared their respective perspectives on mediation in India, in particular, the need for commercial disputes mediation, reasons for the lukewarm attitude towards it, popular misconceptions and the potential ways forward towards making mediation a success story within the Indian business community. Whilst Ms. Dalal pointed out the issue of the government, as the biggest litigator, being reluctant to settle disputes, Mr. Chakravarty suggested experts on dispute resolution boards taking on a mediator role could potentially address the problems pertaining to loss of time in adjudication and sanctity of their ‘orders’. Mr. Mishra, describing mediation to be the “need of the hour” and a “supplement” to the judicial process, discussed his role in the settlement of $2.9 million Sesa Goa maritime arbitration. Mr. Mohapatra expressed that if promoted well, mediation could be a “win-win” for the industry and the legal fraternity. Mr. Suresh Sharma opined on the suitability of forensic accounting cases for resolution by mediation and Mr. Chand conveyed the current general Indian perception of mediation being appropriate only for family disputes. The panel also discussed the importance of cross cultural awareness in mediation, as different cultures treat the topic of dispute differently. The key sentiment resonating during the panel discussion was the exigency to create an awareness and understanding of mediation in India, particularly amongst the micro, small and medium enterprises, a cause in which organisations like the Bombay Chamber of Commerce could act as a crusader. That, together with a strong regulatory support, could allow commercial mediation to succeed in India. The discussion also brought to the fore a clear concern regarding the governmental tendency to prefer litigation being a major roadblock as well as the possibility of misuse as a mere dilatory tactic. Nevertheless, there was consensus regarding the significance of mediation towards offering cost-effective solutions to commercial disputes, fostering business relationships and reducing the existing burden on the Indian judiciary. At the same time, the live poll conducted amongst the seminar attendees comprising of General Counsels, Organisational heads, Divisional heads and various Legal Professionals; showed that about sixty three percent (63%) considered quick settlement to be the most important factor for a company in a dispute, which supported the panellists’ views on the significance of commercial disputes mediation. The opinions were relatively more divided on the issue of the kind of mediation that would succeed in India, with thirty eight percent (38%) opting for mediation by way of contractual provision, followed by twenty four percent (24%) opting for court ordered mediation, twenty one percent (21%) for party referred mediation and eighteen percent (18%) for mediation being integrated into corporate dispute resolution policies. During the seminar, the attendees concurred with the panellists’ concern regarding government authorities’ reluctance to settle disputes. They also sounded the need for a formal mediation law in India whilst welcoming the initiative towards encouraging mediation by way of the provisions for pre-institution mediation and enforcement of mediated settlements in The Commercial Courts, Commercial Division and Commercial Appellate Division of High Courts (Amendment) Ordinance dated 3 May 2018. 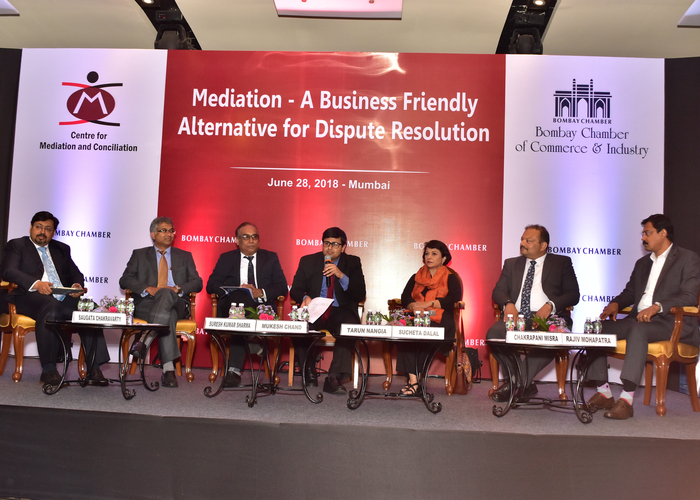 One of the questions raised was whether recourse to interim relief under Section 9 of the Arbitration and Conciliation Act, 1996 could be considered by corporate litigants to be a more concrete option as opposed to mediation. Hon’ble Justice Mr. V.M. Kanade (Retd.) responded sharing his view that relief under Section 9 would not resolve the underlying dispute between parties which was capable of being settled by mediation whilst preserving the commercial relationship in the process. The importance of the need for business executives to develop a sound understanding of mediation as a dispute resolution / mitigation mechanism cannot therefore be stressed enough. Mr. Anuroop Omkar, Partner AK & Partners & External Advisor to the CMC narrated five successful commercial mediations handled by him in the past *, some of the key takeaways being that even when disputing parties appeared to be ‘unequal’, with one party seemingly having an upper hand, the mediation process was the great equalizer and that mediation aimed for solutions to disputes rather than retribution or apportioning blame. Hon’ble Justice Mr. B.N Srikrishna (Retd.) further opined, at the time of CMC’s website launch, that mediation was not dispute resolution but dispute mitigation when the parties sensed that there was a possibility of a dispute. Overall, the seminar accentuated the strong need to develop a pro-mediation culture within the Indian corporate sector along with a robust structural framework by way of legislative reform to support mediation, which in turn would facilitate the Government of India and India Inc’s priority objective of achieving ‘Ease of Doing Business’. As Henry Boyle, an early eighteenth century Anglo-Irish politician had aptly remarked, “the most important trip you take in life is meeting people half way.” The CMC, through its services, aims to enable that trip and in the process, aspires to be the most reputed platform for mediation of commercial disputes in India, through unimpeachable neutrality, best in class governance standards and competent mediators. Ms. Karishma Galliara is a dual qualified (India, England & Wales) lawyer, previously engaged in shipping litigation at a Singapore based foreign law firm and currently in an in-house legal capacity at Excel Industries Limited, Mumbai, a member company of the Bombay Chamber specialising in chemical manufacturing and waste management solutions. *All names and details were changed to preserve confidentiality of mediations.